Dad mowing the lawn on a Saturday morning. 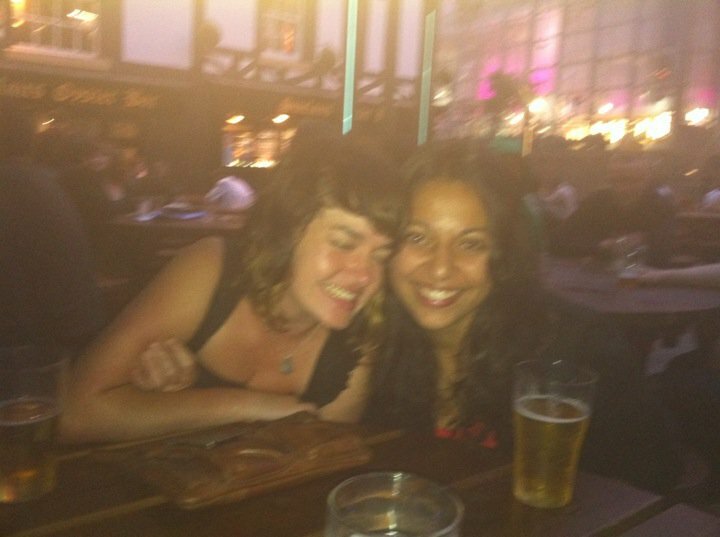 Needless to say, Miranda’s friendship was extremely important for my time up in Manchester and at the time that I began to question what I was doing in my life, she stepped in with her gorgeous, little chipolata fingers, picked me up and pushed me forward. Some friends are there for the laughs and other friends are there to challenge you to become the person you want to be. She did both. What a woman. So anyway, around this time last year we had both returned back to Australia, her being up north in Brisbane and me being in Melbourne. After a couple of months, I headed to Kiribati to spend time with my family and she went to work for a school in an Aboriginal community in outback Northern Territory. After we had both been there for a month, we spoke on Skype and began exchanging stories about the life we were living. Living on the outer island of Marakei where there is no electricity or running water, I spoke about how my days were spent weeding the garden around the hut, learning how to weave mats out of coconut tree leaves, preparing the freshly caught fish and lighting the fires to cook the lunch and dinner for the family. The days were incredibly hot and during the day time would move slowly. Minutes tick away and there wasn’t much to do except wait for the time to pass, waiting for the heat of the sun to die down so that we could work again. When we weren’t working, time was spent with a lot of reading, playing card game after card game, rubbing coconut oil into my grandmothers hair, brushing my cousins knee length hair while she gossiped about boys that she liked. 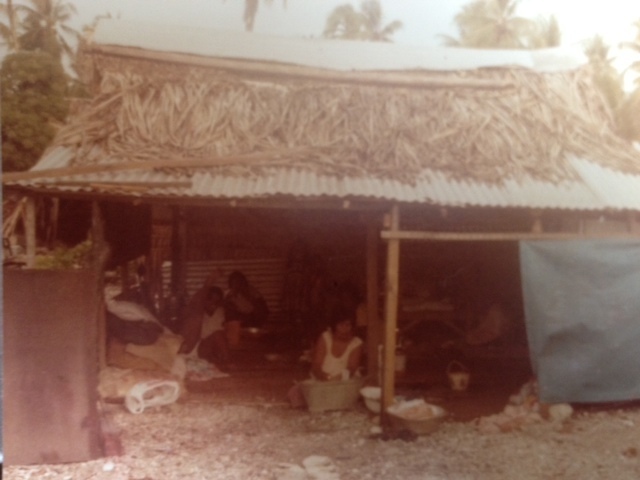 The elders of my family would drop by our hut for a cup of tea and they would tell me stories about my family. They would tell me how beautiful my grandmother and her sister were, tell stories of neighbouring islands and make us all laugh with their tales of my ancestors. Each island that make up Kiribati have their own identity or traits that the locals identify with that island. Just like how Victorians in Australia are known for being Aussie Rules crazy or how Northerners in UK are known for being friendlier than the south, so would each island of Kiribati have their own characteristic. Everyone in the circle looked around at me and laughed. While everyone else in the circle were sitting cross legged, me and this other boy both had our legs bent to the side. This was only one of many instances. So I asked around. What are other characteristics from the other islands? I-Kiribati people reading this, if you disagree or have anything else to add, please do so! Marakei: The ‘womens island’, people that stare and the island of black magic/witches. Aranuka: Beautiful people with big eyes though they always seem to change the details in the stories they tell. This is only a snippet of info about the different islands and in all honesty, I’m not sure how entirely correct this is, these are just notes I wrote down after speaking to my Auntie Bebe one night. My Grandma comes from Marakei and my Grandpa comes from Tabetueia North which means that my ancestry consists of witches and criminals. I would like to think that this means that I’m tough and scary but then again I’m also one to hide around the corner from after breaking the clothes horse in the backyard after swinging too hard. Back to Miranda. While speaking on Skype about the lives that we were currently living, it suddenly began to dawn on us that our experiences were very similar. Card game after card game. Waiting for the sun to pass in order to work again. Teaching the younger generation the stories of their ancestors. Even women grooming of each others hair while looking after the groups of children. While Miranda was telling me this, I was amazed that here we were about a 10 hour flight from one another, in completely different countries and yet here we were living the same sort of life. Maybe it doesn’t for you but to me this blows my mind. It got me thinking. These communities, these countries when you look at the basic life they lead, we’re all the same. Fundamentally, at the heart of the most basic living consists of finding food, telling stories and nurturing each other. 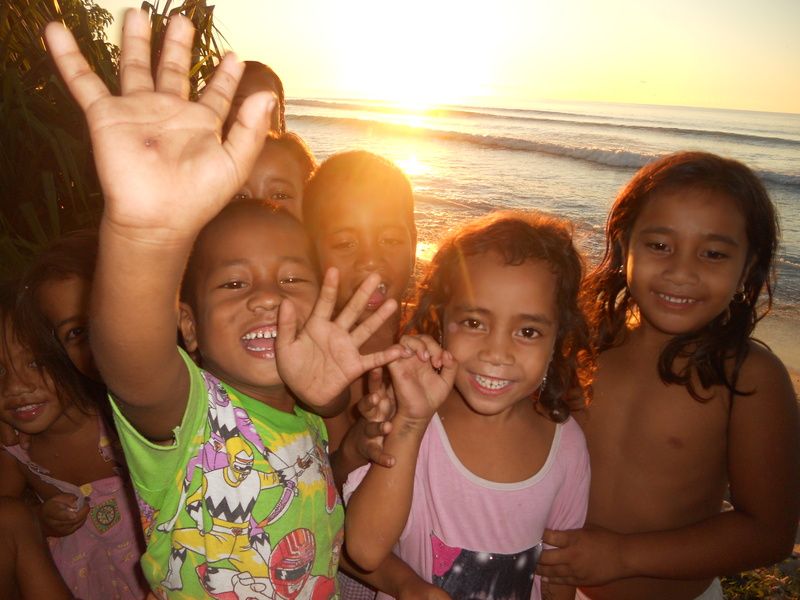 And while I was doing this in Kiribati, I was as happy as any islander kid with a coconut. Maybe we all need to stop rushing a little bit and learn what it’s like to live at our minimum. I suddenly feel like I have a more understanding of the Aboriginal people due to understanding my own culture. I think most people would know that the Aboriginal people in Australia have not been treated well at all – in the past and present. There is this negative attitude that they are drink too much, that they take from the government and that they don’t care for education. In Kiribati, sure it’s frustrating when our family would give our relatives money and they would spent it all straight away on ridiculous things but imagine bringing in something like money to a group of people that for thousands of years didn’t need it. The same as alcohol. In western civilisation these things are ingrained into the culture just that same that these things aren’t in Pacific Islander culture. Without going too much into it, I urge you to look deeper at these communities and your own background. The more we know about ourselves, the more we are open to learn about others. When Aboriginal people are criticised in front of me or in the media, I now find that I respond to this very personally. What if they were talking about Pacific Islanders instead of Aboriginals? 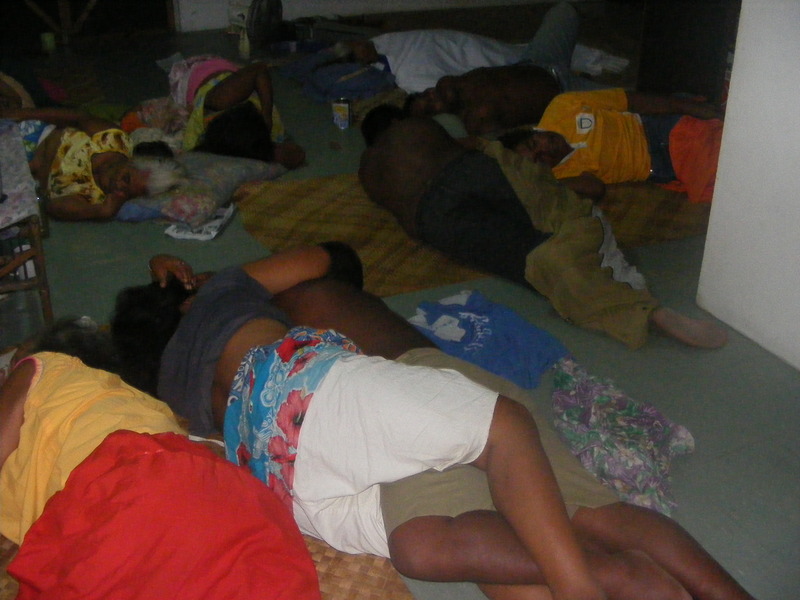 We sleep 15 people in the house sometimes just like Aboriginal families. Some of my cousins have lice and I will make them sit between my legs on the floor and yank their hair around trying to get rid of it. We don’t write our family stories down – it is the new generations responsibility to remember them and pass them on. Aren’t we all the same? Would you say this to my face if you replaced the word Aboriginal with Pacific Islanders? I love Australia and I am very proud to be a citizen of this beautiful country but that doesn’t mean that I excuse it for its treatment and attitude towards Aboriginal people. If you can, I urge you to go out somewhere and live a minimal life for a little bit. Go outback. Go outside. By all means, come with me to Marakei next time and learn how to hunt for crabs in the mud, fetch water out of the well and make a hut out of a coconut tree. I guarantee you will realise how innovative and clever the people are that live on the land. I urge you to go out and keep looking for more ways as to how all of us on this world are the same rather than concentrating on the differences. In the meantime, do me a favour and lets all sing along to this. All of you. You know you want to. Next Post A very Islander week. Bon! What a lovely thing to say! Thanks for reading. To get support from someone as great and well travelled as you is very inspiring! You should write a piece on your travels and your work. I can put it on here as a bit of a feature. What do you think? Maybe something along the same lines as this article? Criminals, convicts and witches. I think I’m destined for greatness!